More than one of the earliest ecclesiastical writers have given credence, though apparently without good reason, to the legend that Ignatius was the child whom the Savior took up in His arms, as described in Mark, ix, 35. It is also believed, and with great probability, that, with his friend Polycarp, he was among the auditors of the Apostle St. John. If we include St. Peter, Ignatius was the third Bishop of Antioch and the immediate successor of Evodius (Eusebius, "Hist. Eccl. ", II, iii, 22). Theodoret ("Dial. Immutab. 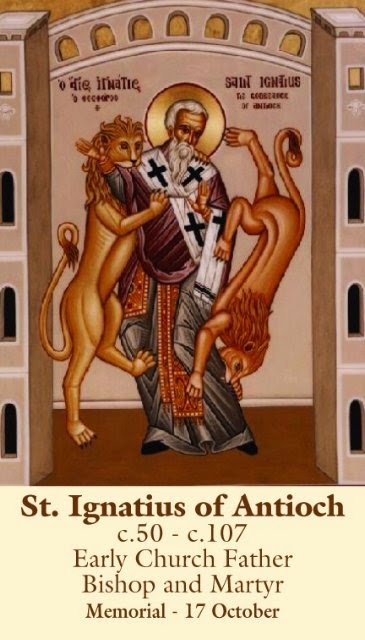 ", I, iv, 33a, Paris, 1642) is the authority for the statement that St. Peter appointed Ignatius to the See of Antioch. St. John Chrysostom lays special emphasis on the honor conferred upon the martyr in receiving his episcopal consecration at the hands of the Apostles themselves ("Hom. in St. Ig. ", IV. 587). Natalis Alexander quotes Theodoret to the same effect (III, xii, art. xvi, p. 53). All the sterling qualities of ideal pastor and a true soldier of Christ were possessed by the Bishop of Antioch in a preeminent degree. Accordingly, when the storm of the persecution of Domitian broke in its full fury upon the Christians of Syria, it found their faithful leader prepared and watchful. He was unremitting in his vigilance and tireless in his efforts to inspire hope and to strengthen the weaklings of his flock against the terrors of the persecution. The restoration of peace, though it was short-lived, greatly comforted him. But it was not for himself that he rejoiced, as the one great and ever-present wish of his chivalrous soul was that he might receive the fullness of Christian discipleship through the medium of martyrdom. His desire was not to remain long unsatisfied. Associated with the writings of St. Ignatius is a work called "Martyrium Ignatii ", which purports to be an account by eyewitnesses of the martyrdom of St. Ignatius and the acts leading up to it. In this work, which such competent Protestant critics as Pearson and Ussher regard as genuine, the full history of that eventful journey from Syria to Rome is faithfully recorded for the edification of the Church of Antioch. It is certainly very ancient and is reputed to have been written by Philo, deacon of Tarsus, and Rheus Agathopus, a Syrian, who accompanied Ignatius to Rome. It is generally admitted, even by those who regarded it as authentic, that this work has been greatly interpolated. Its most reliable form is that found in the "Martyrium Colbertinum" which closes the mixed recension and is so called because its oldest witness is the tenth-century Codex Colbertinus (Paris). The character of St. Ignatius, as deduced from his own and the extant writings of his contemporaries, is that of a true athlete of Christ. The triple honor of apostle, bishop, and martyr was well merited by this energetic soldier of the Faith. An enthusiastic devotion to duty, a passionate love of sacrifice, and an utter fearlessness in the defense of Christian truth, were his chief characteristics. Zeal for the spiritual well-being of those under his charge breathes from every line of his writings. Ever vigilant lest they be infected by the rampant heresies of those early days; praying for them, that their faith and courage may not be wanting in the hour of persecution; constantly exhorting them to unfailing obedience to their bishops; teaching them all Catholic truth ; eagerly sighing for the crown of martyrdom, that his own blood may fructify in added graces in the souls of his flock, he proves himself in every sense a true, pastor of souls, the good shepherd that lays down his life for his sheep.